According to Persistence Market Research, the global bouillon market is anticipated to show significant market share and a moderate growth rate during the period of forecast 2017-2025. The global bouillon market has seen positive growth since 2012. 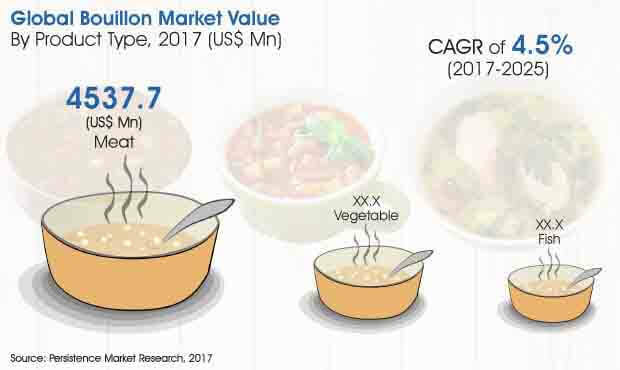 The global bouillon market is projected to grow at a CAGR of 4.5% throughout the period of assessment to reach a valuation of about US$ 10 Bn by the end of the assessment year (2025) from a value bit over US$ 7 Bn in 2017. This significant growth can be attributed to the rising awareness of fortified foods, growing disposable income and high per capita expenditure on prepared food, enhanced retail formats, rising awareness among consumers about bouillon products, growing demand for vegan food products, growing demand for organic bouillon as well as growing demand for processed food products. Meat segment in the product type category is anticipated to be the largest in terms of value and market share. In 2017 this segment reflect a valuation more than US$ 4 Bn and is estimated to touch a market valuation more than US$ 6 Bn by the end of the year of assessment. The meat segment is projected to grow at a value CAGR of 4.1% throughout the period of forecast, 2017-2025. In 2025, the meat segment is expected to reflect a huge market share of more than 60% thus dominating the global market by value in the product type category. Meat product type segment is further segmented on the basis of poultry, by beef and others (lamb, ham and pork). Poultry and beef sub segments are expected to largely contribute to the growth of the parent segment from market valuation and growth rate standpoints. The poultry sub segment is the largest with a high market value and share. It is anticipated to reach a market value a bit under US$ 3800 Mn by the end of the assessment year (2025) from a valuation of around US$ 2800 Mn in 2017, thus leading the market during the assessment period. The beef sub segment is poised to run at a faster pace and expected to register a value CAGR of 4.9% throughout the period of forecast, 2017-2025. Beef sub segment is the second largest and is expected to reach a value a bit over US$ 2 Bn by 2025 end from about US$ 1.4 Bn in 2017. The others segment reflects lower value and is a slow growing segment. Fish segment in product type is anticipated to grow at a significant rate, higher than the meat segment and is considered to be the second fastest growing segment in the coming years. By the end of the assessment year, the fish segment is expected to reflect a near about US$ 1500 Mn valuation from a value of about US$ 1 Bn ion 2017. The fish segment is poised to grow at a moderate value CAGR of 4.4% throughout the period of forecast, 2017-2025. Edwards & Sons Trading Company, Inc.